Many people with Marfan syndrome and some related disorders experience pulmonary complications, or problems with their lungs. If you have Marfan syndrome, it is important for you to see a pulmonologist (lung doctor) if you suspect that you have any problems with your lungs. 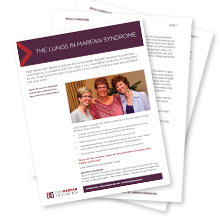 What are the common types of lung problems in people with Marfan syndrome? How are lung problems treated in people with Marfan syndrome? What can you do on a day-to-day basis? Find these answers and more in the "Lungs in Marfan syndrome" download.